The Small Majesty Cherry Hardwood Cremation Urn is handcrafted in solid cherry with an elegant cherry finish and laser etched decorative border at the lower edge of the urn. The urn loads easily through a bottom opening panel attached with screws. These cremation urns are manufactured in the Northwest by a small but talented group of woodworkers. This urn is the perfect size for families wishing to share cremains, or for infants, toddlers, and pets with healthy weights no more than 40 pounds. 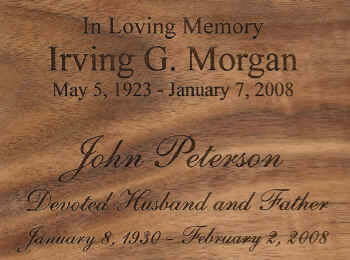 Personalized engraving is offered on either the top of the urn or the front of the urn. Please limit engraving to no more than 35 spaces per line. Check engraving information to be sure spelling, punctuation, capitalization, and dates are correct. Engraving will be done exactly as submitted. As with all urns but especially with bottom loading urns, it is important to keep the cremains in a sealed plastic bag inside the urn. This plastic bag can take up 5-10 cubic inches of space in the urn. 7" W x 4" D x 4.75" H - Holds approximately 60 cubic inches which is adequate for most pets with healthy weights less than 40 lbs, or for infants and toddlers with healthy weights less than 40 pounds. Usually ships in 3-4 Business Days after order is placed, even for expedited orders. Ships from the West Coast.